It was great seeing Justiz using some of his Judo skills on the mat to upset his opponents. This competition saw everyone compete under the Sports Jiu Jitsu Federation rule set which is great if Jiu Jitsu becomes a recognised Olympic sport. As usual the vibe was great and everyone took something away to work on to prep for the next one. Our 2017 end of year grading kicked off with the kids team grading which saw 11 kids achieve new grades, including 1 new belt. 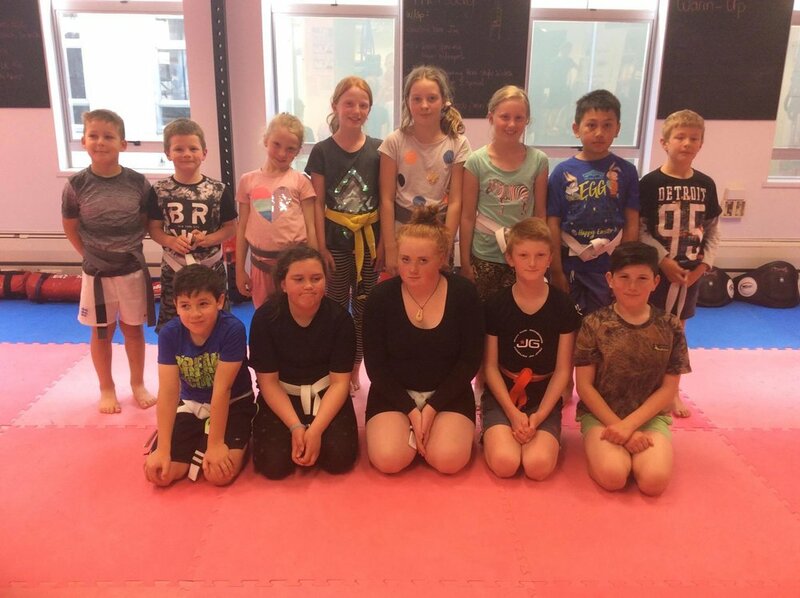 The kids team have really improved throughout the year, and the skills they have developed, both in Jiu Jitsu and self-confidence, really showed at the end of year grading. The kids were followed by the blue belts who were put to the test by Coach Jay. Congrats to Danny, Jimmy, and James who demonstrated just how far their technical knowledge has come. Coach Jay then applied the test pressure to the purple belts, with an added set of tests beyondd the syllabus. The purples really upped the ante and set a very high standard for future gradings. Chris, Corrin, and Andrew all walked away with an array of new tabs. Finally, Coach Jay himself was awarded two more tabs on his brown belt at the Zero Gravity grading by Professor Andrew Craven. Grading week at J's Gym really put on display the growth the team has had in 2017, and has set a very high bar for 2018. The kids team ended the year on a high after a very successful grading. From left to right: Coach Jay, blue belts Danny, James, and Jimmy who all achieved new tabs, and Coach Andrew. From left to right: Purple belts Andrew, Corrin, and Chris who achieved new tabs, and proud Coach Jay. Brazilian Jiu Jitsu has a relatively short history which affords a few rare opportunities to train with the founding members of the art. Over Labour Weekend four of our BJJ team headed to Allegiance BJJ Academy in Hastings to attend the 2017 Clark Gracie camp. This year Professor Clark Gracie brought his father, Grandmaster Carley Gracie, over from California to teach at the camp. Carley is a Red Belt in Brazilian Jiu Jitsu, which is the 9th Degree of Black Belt; the highest grade achievable. Carley’s arrival in New Zealand for the camp marked the first visit of a Red Belt to New Zealand. Carley is the son of Carlos Gracie Senior, who was one of the originators of Brazilian Jiu Jitsu. This gave our team a rare opportunity to train under one of the originals. During the 3-day camp Carley gave us an insight in to the early days of the art, and outlined some of the events which changed the martial arts landscape. He also demonstrated many of the self-defence techniques which made the art famous, and his son, Clark Gracie, demonstrated some of the modern techniques which have made him a world champion in recent years. Our team walked away from the camp with an overwhelming amount of knowledge, and much deeper appreciation for the art and its history, which we look forward they look forward to passing on to the rest of the team. The J's Gym team with Jiu Jitsu legend, Carley Gracie. The J's Gym kids Jiu Jitsu team has been growing strongly over the past year and this growth was apparent at the Term 3 grading. This was our biggest grading to date with some 15 students reaching their next grade. This achievement is a product of the consistent effort the kids put in during every training session, along with their readiness to learn, and the dedication their coaches Jim and Danny show to the team. We are all super proud of the team and look forward to seeing their continual growth. 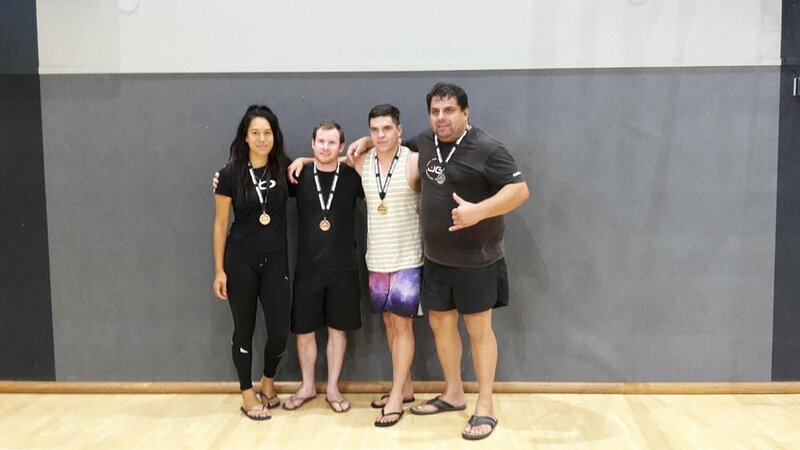 On Saturday September 30 the J's Gym BJJ team competed in the Wellington Open Submission Only (Gi) competition. Steve Looker won gold in the Men’s White Belt 76kg division. Naim Hamdi-Pacha competed in the Men’s White Belt 82.3kg division. Naim won his first fight convincingly with a figure-4 submission from side control. Unfortunately, his remaining fights didn't get him the results he wanted. Finally, Colin Bennett competed in the Men’s Blue Belt 100.5+kg division. However, he lost both his fights in the overtime arm bar challenge. All fighters went home with a load of lessons learned, and a lot to work on. The team would like to thank their coaches and team members for their help with preparation for the comp. On Friday 15th of September we were fortunate enough to be able to attend a seminar by Rigan Machado, once considered to be the greatest grappler on the planet, with an impressive 365 win streak in major competition. The 2 hour seminar was held at Twin City Martial Arts, and required extra mat space to be created due to the large turn out of students. Rigan demonstrated 9 techniques in total, and told many stories of lessons he has learned over his 50 odd years of training Jiu Jitsu. He also introduced concepts he has been developing at the forefront of the evolution of Jiu Jitsu, and gave the team a lot to think about and drill. 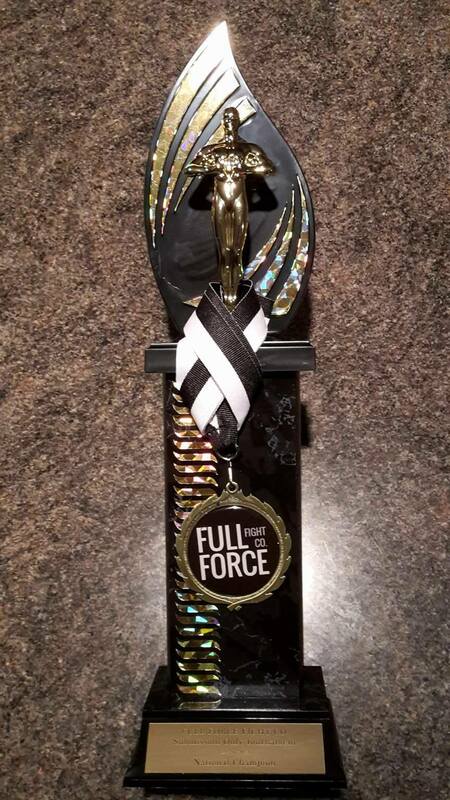 On Saturday the 2nd September, 2017 Colin and Christian Bennett traveled to Hamilton to compete in the Full Force Submission Only National Gi tournament, where matches can only be won via submission as a points system is not used. The tournament saw over 80 competitors,from as far afield as Christchurch, converge at the Core MMA gym. This was Christian’s first competition as an adult, having turned 18 a couple of weeks before. He had two very tough fights against a very physical opponent. Unfortunately he didn’t come away with the result he wanted but took a lot away from the day. Colin was entered in the Masters over 80 kg advanced. This division had two pools consisting of four competitors in each pool. The top two from each pool went into semi-finals and then the winners of each semi-final compete for the national title. Colin won gold in his division with four submission wins. The guys are now preparing for the next competition in Wellington on the 30th September.